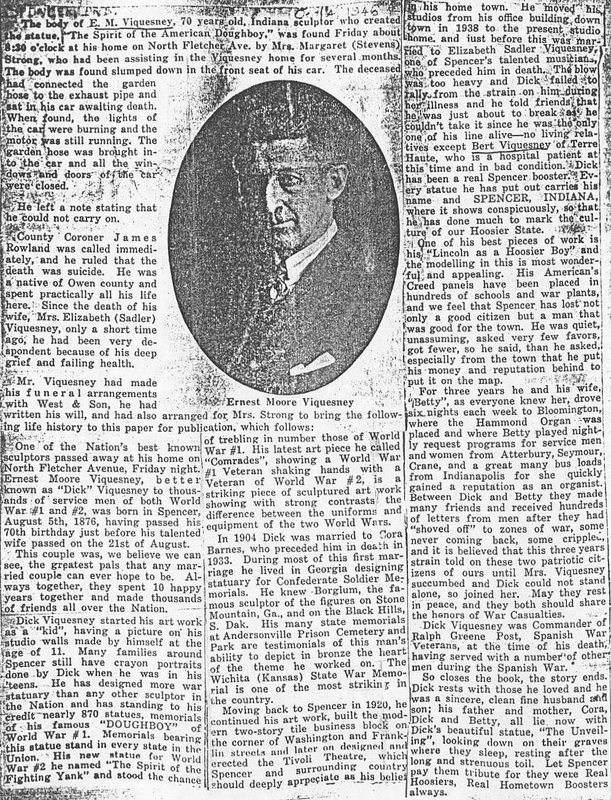 Left: The obituary of Viquesney's first wife, Cora Bell Barnes, who died October 3, 1933. Thanks to Earl D. Goldsmith and Alan Anderson for the article. During his career, Viquesney boosted himself as an artist and sculptor, but didn't write much about himself as a person. 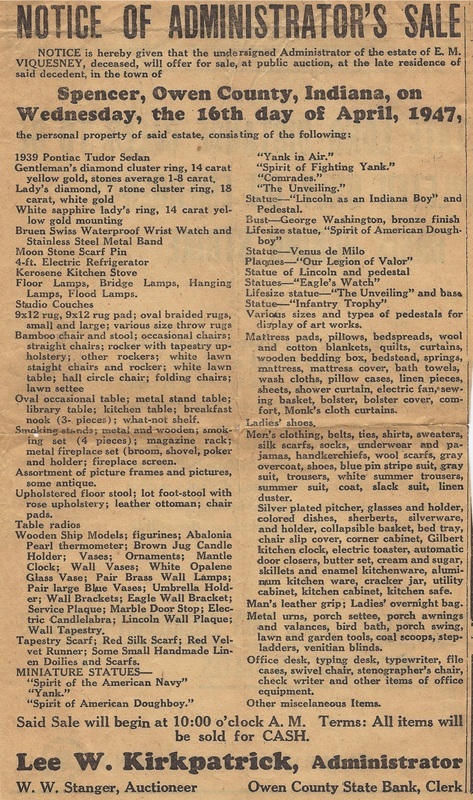 It's ironic, then, that much of what we know about him comes from his own final self-written "life history" (below) that was brought to the local Spencer, Indiana newspaper and included in his obituary after he had committed suicide. But even this final document is untrustworthy in many of its details: Viquesney didn't move back to Spencer until 1922 (not 1920); he didn't move to his new studio until 1939 (not 1938); and he and his wife Betty drove to Bloomington, Indiana six nights a week for two years (not three) to entertain troops at the USO during WWII (all documented by dated, independent newspaper accounts). Ambiguous to the very end, it isn't clear if the number of Doughboy memorials ("nearly 870") Viquesney refers to are "The Spirit of the American Doughboy" itself, or whether other memorials such as plaques, structures, or headstones are also included. If "nearly 870" does refer to only "The Spirit of the American Doughboy", then T. Perry Wesley's "Doughboy Searchers" have a lot more searching to do, as only about 140 have turned up. It seems Viquesney wanted to be remembered as a Hoosier legend, downplaying his years in Americus, Georgia; his statement that every statue he ever made bore his signature and the name of Spencer, Indiana is patently false. There are many, including ironically, the first "Spirit of the American Doughboy" he made (now standing in Nashville, Georgia), which are embossed with the name of Americus, Georgia. Mrs. Elizabeth (Sadler) Viquesney, a widely-known and most talented organist, and wife of Ernest M. Viquesney, creator and distributor of the "Doughboy Statues", died last Thursday afternoon at her home on North Fletcher Ave. following a few months illness. She was the daughter of Ed Sadler of Spencer and the late Mrs. Minnie (Wooden) Sadler. For over 25 years the deceased was oragnist at the Spencer Methodist Church. After she and Mr. Viquesney were married he purchased for her one of the finest Hammond electric organs and for the past ten years has favored thousands of soldiers and sailors, and all friends with her gifted talent at the organ. "Betty", as she was called by many, played concerts at Bloomington for a number of years and also played concerts at Canyon Inn, McCormick's Creek State Park, and many other places throughout the state. One of her last concerts was played here in Spencer when Mooney Sales & Services was formally opened. Here she played for her Owen county friends and neighbors. She possessed a most pleasing personality, was talented and was truly loved and honored by many. Survivors include the husband; her father, two sisters, Misses Pauline and Mildred Sadler, all of Spencer; and several aunts and uncles. Funeral rites were held Sunday afternoon at three o'clock at West's Funeral Home, Rev. D.P. Rowlette, minister of the Baptist Church, in charge; and interment was made in Riverside cemetery. Notice of estate sale of E.M. Viquesney. Photo supplied by Robert. L. Jackson.